This book concerns the wanting, getting, and giving of power. Recent advances in medicine, sociology, and psychology have deepened our understanding of the motives, skills, and experience that operate between leaders and those who are led. Since power is about decision-making, it figures not only in offi cial institutions but in other organizations, including political parties, pressure groups, trade associations, business enterprises, trade unions, and many other types of organizations.A general theory of the political personality is set forth here. Lasswell describes the process by which power becomes a value of first importance and the way appropriate skills in exercising power are acquired. He shows that special political types such as agitators or administrators are related to basic types of character that contribute to how they lead. Finally, his analysis offers original perspectives to understand democratic leadership.Lasswell offers definite suggestions for perfecting self-observatories in national and world affairs and for forming democratic personalities, selecting and training democratic leaders, and reducing destructive conflicts in human relationships. Power and Personality followed the author's 1930 work Psychopathology and Politics, which was widely hailed for its pioneering approach. 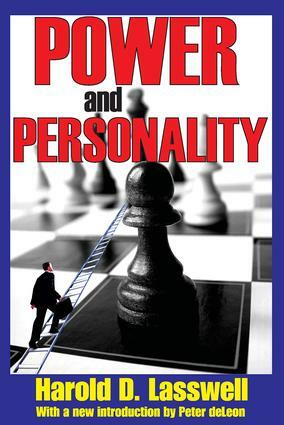 Power and Personality reevaluated the entire issue of the relationship between psychology and politics in the light of subsequent experience and scientific developments since publication of that earlier work. Lasswell's ideas continue to carry great weight and persuasiveness.